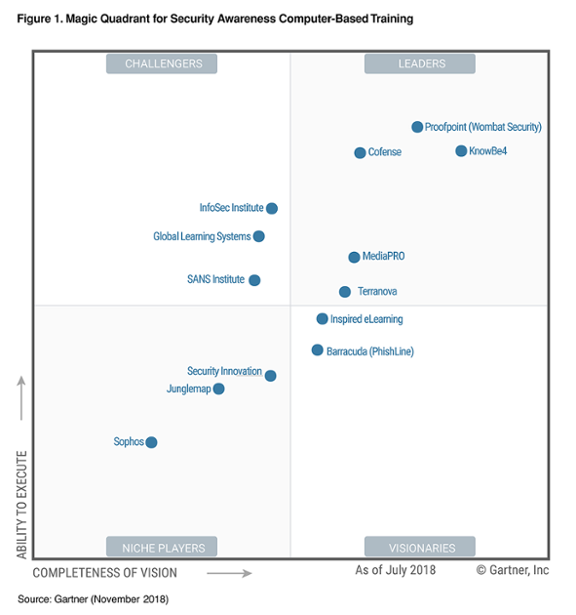 KnowBe4 has been positioned by Gartner, Inc. in the Leaders quadrant of the Magic Quadrant for Security Awareness Computer-Based Training for the second year in a row. Gartner's evaluation is based on completeness of vision and ability to execute. We are very proud of this accomplishment. We consider our positioning in the Leaders Quadrant by Gartner confirmation of our ability to innovate new technology-based paths based on real-world social engineering methods used by attackers. As the fastest-growing company within this market, our mission to train employees to make smarter security decisions within client organizations has been successful, enabling organizations with a limited budget a chance to use world-class training and simulated phishing to improve their security posture and mitigate risk. Perry Carpenter, KnowBe4’s Chief Evangelist & Strategy Officer stated, “We are honored to be positioned in the Leader’s Quadrant. We believe that it is a direct reflection of our strong and consistent year-over-year growth, 14,000+ client organizations, rapidly growing toolset and content library, and our proven platform and methodology for delivering measurable results to organizations around the world. We look forward to pushing-the-envelope even further in 2018."